Having just opened in 2014, the Marstall Festzelt is the newest of all the Oktoberfest beer tents. It also has one of the more “interesting” themes as far as Oktoberfest beer tents go—horses of all kinds. Merry-go-round horses, rainbow-maned horses, unicorns, you name it. This theme pays tribute to Oktoberfest’s equestrian origins (it used to be all about that horse race) and there’s even a giant, rotating carousel inside the tent where the band plays. We told you it was interesting. In 2014 the Marstall tent opened, replacing the Hippodrom tent that had opened in 1902 and featured a horse track in the centre where guests could ride—sure, that sounds safe. A little corruption here, some tax evasion there and, eventually, the tent that thought beer drinking and large animals were a great combination puttered out. The name Marstall comes from a riding school and place for fancy people to hang out in 19th-century Munich. 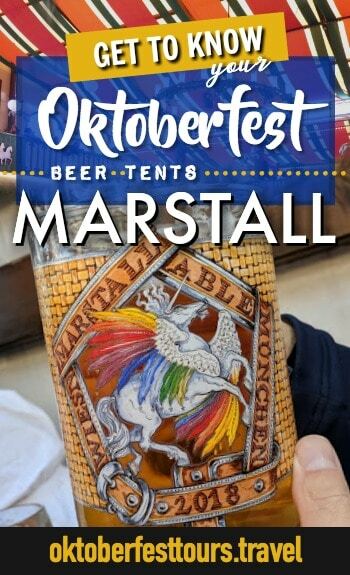 Today, the Marstall tent, though still horse-themed, makes an entertaining first stop at Oktoberfest as it’s the very first beer tent upon entering the Wiesn. Will you think you’ve just entered a circus big top? Absolutely. But if you didn’t come to Oktoberfest to act like a kid again, then what are you doing here? The Marstall tent serves Spaten beer in anything-but-traditional beer mugs and even wines and champagne because horse people be fancy. Also, their outdoor beer garden is one of the best at Oktoberfest. It’s time to stop reading about Oktoberfest beer tents and get yourself inside one! Check out our upcoming Oktoberfest tours here and get your planning on.